I distinctly remember telling people the white board was a “Kanban board” and when people asked “What if I have too many cards to put see the board?” | telling them “That is a sign you have too much work on the go” - I was attempting a crude form of work in progress limits. 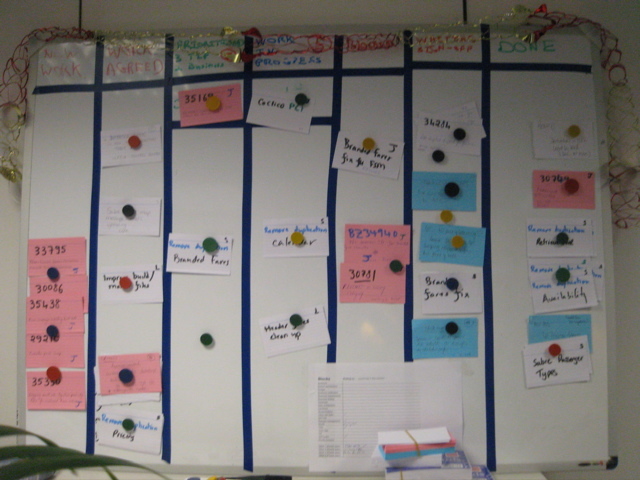 I’ve mentioned the Kanban software development method in this blog before. For those who don’t know its “the new kid on the block” in Agile circles - although the originator (David Anderson) would be quick to point out it is designed to be a Lean development method. The two Kanban teams were in a different position. Although they had “projects” to do most of their work was sustaining work. There were systems in place and issues needed fixing. Many of the things the company called “projects” were really to small to be worthy of the name - but that’s another story. As a result the teams had more diversity in their work and more variability. Work would just appear - and disappear. They would have been hard pressed to keep to an unchanged task list (backlog) for a one week iteration, let alone a four week sprint. For anyone creating a Kanban board some advice: big boards a better, involve the team and use coloured tape - insulation tape works well. In the past I’ve just drawn lines on the white board, with Kanban there is more movement and the lines are lost so I used insulation tape to create hard barriers. Developers broke the limits not because they disagreed but because they were accustomed to starting new work when they hit a problem. For example, a developer is working on item X, they come to a block on X so start on Y. In the extreme they block on Y and start on Z. You now have three partially done pieces of work. Trying to instil a “resolve the block” approach was difficult - largely because this organization was overloaded with managers and developers had been “taught” not to resolve these type of issues themselves. As anyone who has read Changing Software Development will know, I’m an advocate for incremental improvement. While Scrum (and XP, etc.) hold out the promise of overnight Agile - one big bang and your there - I see Agile as a journey not a destination. The 2009 schedule for the conference and the registration system is now up and running and it is a stronger programme than every - and that’s saying something! I used to be on the programme committee for the conference and every year we used to reject a few submissions. This year I believe there were as many proposals rejected as accepted. Yes there is C and C++ on the programme but there is also Objective-C, D, Java, C#, AJAX, Python, SOA, Erlang, Agile, Lean and lots more. In fact last year there was less C++ on the schedule than functional languages (F#, Erlang, Haskell and Lisp) - I haven’t done the analysis for this year yet. A regular release cycle is the first step to delivering. Decide what your cycle is, 1 month, 2 months - probably no more than 3 months and do work in those chunks. Size the work to fit in the cycle. Within the release cycle have several work cycles (iterations) of several weeks length. The more variable or unknown your work the shorter your cycles. Its OK to sketch out what will be in upcoming iterations and cycles but don’t get too attached to what is allocated where. It will change. And for that reason don’t go into too much detail - certainly no estimates. All work that goes into the iteration or cycle is rigourously prioritised - 1, 2, 3, ... to N. (As mentioned in Run Scope Creep backwards recently.) At the start of each cycle, then each iteration, the team - and business owner - can have detailed conversations about what is to be done and how it is to be done. It doesn’t make sense to have these conversations earlier - because less is know about the need and thing might change. And it doesn’t make sense to have these conversations later because that is too late. Ideally each release should have its own small goal but sometimes it ends up being a hotch-potch of things. And ideally the team should commit to doing the work. Many Agile books and methods talk about the importance of commitment, I agree but... its hard to get one day-1, it comes with time. These technique tends to work best in the short term. In the long long term where you are going, what your product looks like are a matter of business strategy. Top management should pass down some direction here. Planning for the longer term needs different tools. For the long term - 5 years or more I suggest you start with some scenario planning. When someone asks “when will it be ready?” turn the question around - (1) When is “it” needed by? When does your business need a product to use? What are the important dates for the company - end of quarter? end of year? trade show? competitors? contract signing? Unfortunately too many conversations in the software business seem to involve someone saying “I need everything and I need it yesterday” - not a very useful position, and if its true you should start looking for a new job because there is no way anyone can make that happen. All work needs to be guided by a bigger vision. You can call it a vision or a goal if you wish I don’t mind. Personally I like the term BHAG - Big Hairy Audacious Goal. You’ve got to know where you are going to give context to everything else. There are two ways to run a project. The first - exemplified by Gantt charts - is to get all the pieces of string you think need to do the project, lie them end-to-end and see where you get to. If you read my previous post you’ll see why I don’t like that approach. A friend e-mails to say that his team have almost finished their project plan. There is something about the words “project plan” which are like a red flag to this bull... while I’m prepared to admit I may over react sometimes I don’t think I’m completely crazy and I think I can put some logic behind my dislike of “project plans”. Lets start by defining what I mean. Its not so much a “project plan” - after all I think planning is a great way to explore your problem. As a mental exercise a team planning what they are going to do is good. And I’m all for a bit of critical path analysis to work out what the dependencies are. And I think scenario planning is great. From what I’ve heard war-gaming is another good for of planning. I should admit to an assumption. When this friend says “project plan” I’m immediately imagining Gantt charts and PERT diagrams. There are many other forms of plan which make a lot of sense. I think product road-mapping is an essential activity. Its specifically Gantt and PERT charts that make me see red - and as layman in the field I don’t see much difference between Gantt and PERT to be honest. • The charts create illusion of control; here is a piece of paper which says the project will be done on 1 May 2010 - or whenever. It won’t. That date is the one date the project will not be ready. It might be ready before, more likely it will be ready after but that one date is fantasy. • Many - too many - discussions now centre on “why are you deviating from the plan” - “why are the estimates wrong?” - “how can we get back on plan?” - arguments centre over the plan not the thing being produced. Now prioritise. If its really big make a first pass with MoSCoW rules. Anything which isn't MUST have can be ignored for now - you've probably got more must's than you have time for anyway. Generally I’m not a fan of Moscow rules but they are OK as a starting point when you have a lot of requests. Now within the MUSTs prioritise 1, 2, 3.... N. No duplicate priotities. This way when something increases in priority ther things fall automatically, people immediately see the consequences of their decisions. Now as you work through the list you will find that with items 1..N' you have a a valuable product. Something you can at least show to customers, something people might even pay money for today. Once you start getting real feedback - especially the sort represented by money - everything changes. Once you know what real customers want you are, literally, in business. You’ll want to add new items and look again at your priorities. At this point you've saved yourself the work N'..N plus all the Should Have's, Could Haves, etc. This is running Scope Creep backwards. A shameless act of publicity - for myself and Software East in Cambridge. I’ll be part of a panel at Software East next Thursday. The subject is Building a Software Business, pre-registration is required. I was told the following story this week by one of my clients. He works for a large organization with many software development groups. The company believes retrospectives are a good thing and some people in the company, including my client, are trained in facilitation. A few weeks before Christmas my client got a call from another group lead in the company who asked if he could facilitate a retrospective. “Sure” said my client who went to discuss it with the group lead. “Yes” says the group lead, “but, one of my objectives for the year is to hold a project retrospective so we need to do it this side of Christmas”. This company operates management by objective and the group lead had this objectives and his manager didn’t want to vary the objectives so an “almost done” retrospective it would be. There are two schools of thought on when to hold a retrospective and this case was neither of them. The first school, exemplified by Norm Kerth in Retrospectives is the Big End of Project Retrospective (BEPR). The problem with this type of retrospective is that it occurs too late to make a difference to a project. Only if the same people will be working on something similar sometime soon is there a lot of benefit to the participants. Still the BEPR is a good way of getting started with retrospectives. If you’ve never held one before there is a lot of ground to cover. I find them useful when I’m getting started with a team as a first step towards regular retrospectives and to help loosen the team up. It doesn’t necessarily have to be at the end of a project but to have value it needs to be held in time to make a difference. Do it in “stoppage time” probably makes little difference. The second school of thought is exemplified in Diana Larsen and Esther Derby’s book Agile Retrospectives is the Regular Iteration Retrospective (RIR). I recently came across Joshua Kerievsky’s “How To Run An Iteration Retrospective” which is a good one page guide to this type of retrospective. These are smaller, shorter, retrospectives that occur on a regular basis. Typically these are held at the end of an iteration so anything between 1 week and 4 weeks. By occurring regularly such retrospectives can make a difference while work is in progress. There are two problems here, the first is confusion and the second freshness, let me explain. Simply, people get confused about what is a retrospective at the end of an iteration and what is not. This isn’t helped when you occasionally skip a retrospective. I’ve been known to skip retrospectives, typically when the team is still settling and I can see changes occurring organically. In these cases I prefer to leave things to improve by themselves. I’ve also skipped them when I feel that they will sap morale. I recently worked with a large client where I was coaching several teams. It quickly become apparent that the problems the teams were facing were systematic and beyond the teams ability to fix. What was needed was structural change across the organization. This wasn’t going to happen any time soon but until it did asking the teams to reflect on the problems they faced would only revisit the same old ground. • Review: this happens at the end of every iteration. Look at the work done, count the points (if using), talk about what was done and problems encountered. This needs to happen to close the iteration. Not really a retrospective but sometimes its seen as one. • Informal retrospective: as part of the review or immediately afterwards. A discussion of what has happened, what could be useful and how the team might change. Informal retrospectives are useful when there is not the time for a formal one (they flow naturally after a review), when the team are still settling in or when the team are recovering from a lot of micro-management and learned dependency. • Formal retrospectives: a formal period of time for reflection with some exercises to facilitate thinking. This format also allows you to keep track of what action was decided on and follow up changes. Ultimately all teams should be aiming for this type of retrospective. The second problem with RIR’s is freshness and mainly the formal retrospectives. If you are holding these every second week and doing the same exercises they quickly become boring. The trick is to vary the exercises and try new things. Again this is one reason why I’m happy to use informal retrospectives, more variety. I’ve recently had success using dialogue sheets as a facilitation tool in formal retrospectives. I’ll post my template online soon and blog about it in more detail. One of the big difference between BEPR and RIR is the timeline. In a BEPR the creation of a timeline is normally a (even the) major event. The team map out what took place and when it happened, and then reflect on it. If you are holding RIR then creating a timeline for, say, 2 weeks then it doesn’t get you very far. Hence the need for more activities to trigger reflection. As you might have gathered from above, RIR are in many places displacing BEPR as teams move to more Agile development. Generally this is a good thing but I suspect the BEPR is due a comeback and I think the force for this will be the Kanban development process. Two factors make RIR less suitable to Kanban. Firstly the most advanced Kanban teams don’t bother with iterations. The pull system renders them less necessary, therefore the natural place to hold an RIR disappears. Second, drawing from Lean, Kanban teams may well adopt a “Stop the line” mentality. That is, if the team see a problem the immediately address it rather than waiting for the retrospective to come along. Yet I still think there is are occasions when it is worth the team stopping and actively taking time to reflect. In Lean we might think of this as a Kaizen or Kaikaku event. At such time a BEPR retrospective might be exactly right. Still, schedule them every quarter. Make them frequent enough to make a difference and avoid the problems my client had. So it was with interest I ran across a working paper from Harvard Business School entitled “Exploring the Duality of Product and Organizational Architectures: A Test of the Mirroring Hypothesis” (Alan D. MacCormack, John Rusnak, and Carliss Y. Baldwin). The author’s note Conway’s Law as one example of the mirroring hypotheses and cite several others too - which adds to the evidnece that there is something here. That said, if you are willing to accept their hypothesis and method. There are two minor points that give me concern: 1) all the code they look at is Open Source, 2) we know little about the development practices employed by these teams. Both facts could skew the results, still I’m willing to give them a broad acceptance - then they show the hypothesis stands up.